You can make this with felt, like I did, or use coloured paper if you prefer. The owls are made using the templates from my owl brooch tutorial, then I just drew a heart the size I needed to fit in the gap, cut it out, and used that as the heart template when cutting out my felt. If you're using paper, turn your templates over and draw around them onto the back of your chosen paper with a sharp pencil, then when you turn the cut out shapes over all your pencil lines will be hidden. Position the pieces on the card one by one and carefully glue them in place with a glue stick. You can use goggly eyes (glue these in place with a small dab of craft glue) or cut out white paper circles and draw the pupils on with black marker / felt tip pen (perhaps drawing them slightly off-centre to make it look like the owls are looking at each other). If you're using felt, pin or hold the templates in place to cut out all the pieces. You could sew the wings, beaks and eyes in position (as seen in steps 3 + 4 of the brooch tutorial, sewing a small piece of felt or a black bead for each pupil), or just use craft glue to attach the wings and beak and pairs of goggly eyes. 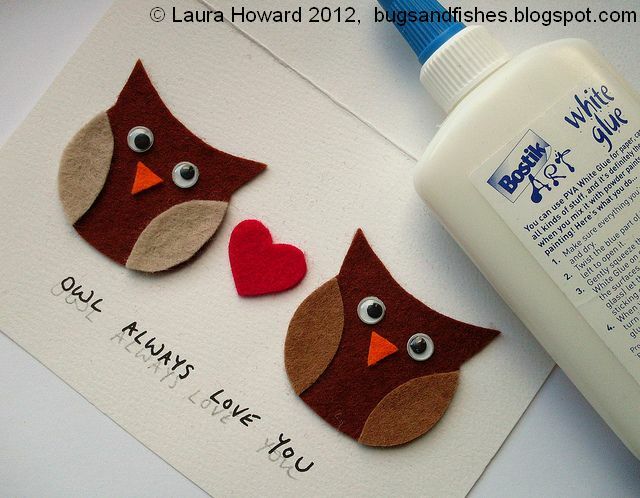 Position the owls and the heart onto the card how you want them, and then stick them in place with small pieces of double sided tape - craft glue would also work, but it can distort the card slightly. 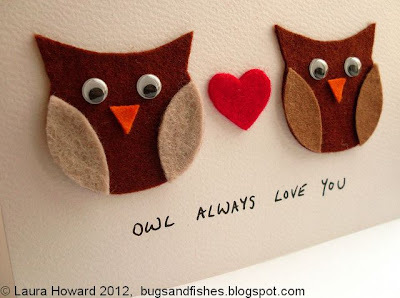 Finally, write "owl always love you" or your own choice of message underneath the owls in your best handwriting. You may find it helpful to write it in pencil first to help you get the words centred nicely, then just erase the pencil marks once the ink has completely dried. If you've used paper for your owls you could also draw a few extra details on them if you wanted, like feathers on their bellies or wings. This is so cute! I'm so tempted to have a bash at making one of these cards for my boyfriend but I'll probably end up gluging my fingers together, I really wish I had some creativity. Great tutorial. I love the googly eyes! 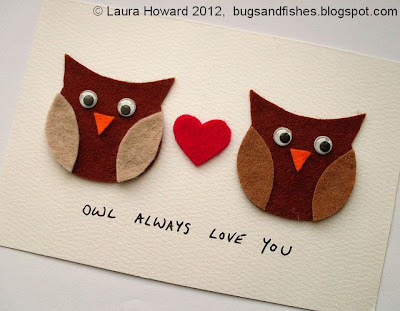 Such a cute owl card! Thank you for the idea and tutorial! I love this, I'm definitely going to give it a try for Valentine's Day! Puns and felt, what more could you want...?